From sticky input prices to falling commodity output prices, U.S. farmers are working their way through some of the most difficult financial times in recent memory. Purdue’s Ag Economy Barometer showed that after a slight July uptick, producer sentiment has turned decidedly lower. As we noted in a previous post this summer banker attitudes about agricultural credit conditions were turning as negative as they had been in some time. We thought that now would be a good time look at credit conditions. Several Federal Reserve Districts report on agricultural credit conditions. In this post we will look at reports from Kansas City and Chicago. Both report credit conditions with a diffusion index. The index is calculated by subtracting the percent of bankers that report that the condition of interest was lower than the previous year from the percent that reported higher and then adding 100. So for example, if 50% responded that loan repayment rates were lower than the same quarter of the previous year, 40% responded they were the same, and 10% said that they were higher, the index value would be 60 (10-50+100). Under this measure the highest possible value of the index is 200 and the lowest is 0. Both of those values would require complete agreement that conditions were increasing or decreasing. The diffusion index for loan repayment is shown in Figure 1. When we last wrote about this index (2016 Q1), the value in Chicago stood at its lowest recorded level (32). In the two quarters that have since passed, sentiment toward repayment rates in the Chicago Fed District (green line) has improved slightly to a level of 48. This is the highest that the index has stood since the third quarter of 2015. Although this is an improvement, it is important to remember that it hasn’t fallen this low except for a few times in the 1980s and once in 1999. Figure 1. 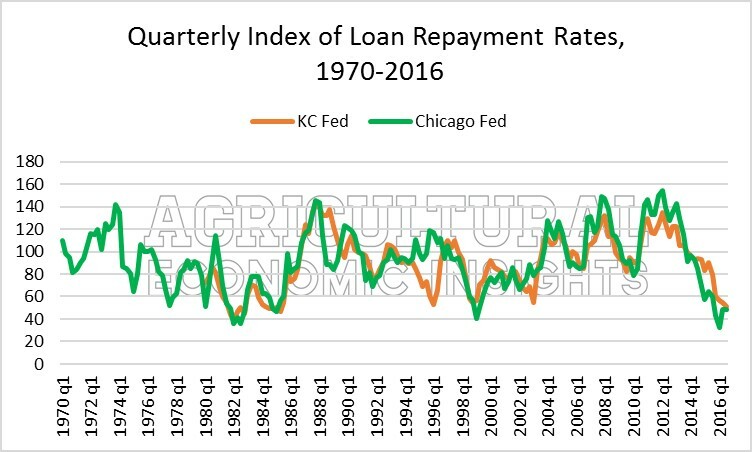 Quarterly Index of Loan Repayment Rates, Kansas City and Chicago Federal Reserve Districts. Source: Ag Finance Databook. The respondents from the Kansas City Fed district (red line) were overall slightly less negative about repayment rates, but note that unlike the Chicago respondents, their attitude continued to decline, falling to a value of 51 in the third quarter of 2016. Banker attitudes toward repayment rates in both districts have dropped very rapidly since the third quarter of 2013. Prior to that, both indices were over 100 meaning that more surveyed lenders expected repayment to increase than felt they would decline. Today, both values are now at some of the lowest levels seen. Overall, the sentiment toward repayment rates is quite negative. Both Fed districts also create diffusion indices for loan demand (Figure 2). In both districts, the indexes are well above 100 indicating that more bankers view loan demand increasing than declining. As was the case with loan repayment, the current period is at a more extreme level than has been seen for some time. In the case of loan demand the index started to increase rapidly in the second half of 2013. Since then it has remained quite elevated. The increase in loan demand occurred slightly before the attitudes toward loan repayment started to decline. Figure 2. 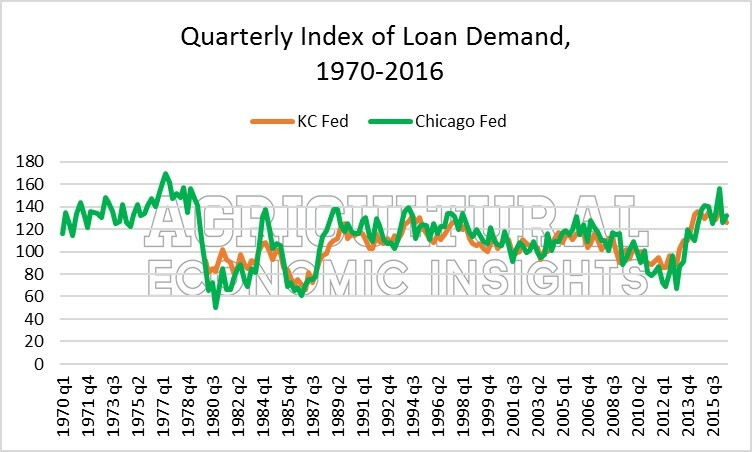 Quarterly Index of Loan Demand, 1970-2016. Source: Ag Finance Databook. During this time of increasing loan demand and increased worries over loan repayment rates bankers have responded by increasing the amount of collateral that they hold against loans. 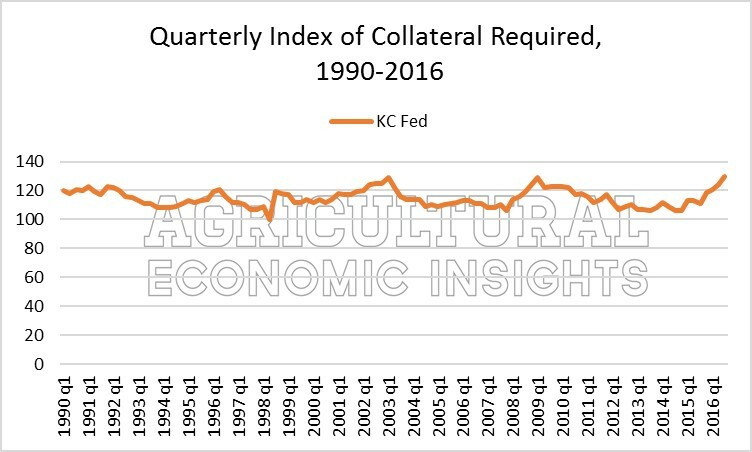 The Kansas City Federal Reserve district reports a diffusion index for collateral required on agricultural loans. Here, one can see the recent increases in the index. It is quite likely that bankers are adding to their collateral positions. However, one should also note that this index has yet to fall below 100. This means that few bankers are rarely anticipating that they will reduce collateral requirements under any conditions. A quick perusal of the data tables in the Ag Finance Databook indicates that the movement in the index comes almost exclusively from lenders moving from the “same” category to the “higher” category. For example, you must go back to the first quarter of 2012 to find even 1 percent of bankers that indicated the amount of collateral required was “lower” than the previous quarter. In other words, they rarely expect collateral requirements to go down and occasionally they expect them to increase as is the case now. Figure 3. Quarterly Index of Collateral Required on Agricultural Loans, Kansas City Federal Reserve Bank. Overall, the results of the quarterly surveys of bankers are clear. Bankers see increased loan demand, see loan repayment rates falling, and are adjusting collateral requirements accordingly. Given the income situation in agriculture this is not surprising. As we move forward there are a few important things to monitor. First, will the recent increases in interest rates persist and continue, or is that a short-term gyration? Changes in interest rates can have an impact on farmers’ ability to service existing debt as well as their ability to qualify for new loans. This can be particularly troublesome if the low intermediate and long-term rates that have been supporting farmland values and investment were to rise. Second, will actual repayment problems become more prevalent? Keep in mind that repayment problems have been very low to date. So increases in repayment problems are to be expected. The bigger question is will these problems become large enough to cause widespread credit problems in the ag sector? In our opinion, they would have to increase substantially above recent levels to become problematic.